Hi, my name is Jo Prusa and Prusa i3 (i3 stands for the third iteration of the design) is my latest design for 3D printers. There are countless variations of this design and it became a staple of 3D printing with hundreds of thousands units worldwide. According to 3DHubs i3 is the #1 3D printer on the planet. It’s open functional design allows for quick maintenance. You can build a simple one for couple hundred dollars or you can chip in more and get the state of the art 3D printer, it’s all up to you. In 2012 I founded Prusa Research, a 3D printing company based in Prague, Czech Republic. Under the brand Original Prusa i3, we started to produce 3D printers to offer makers from around the word affordable, accessible and reliable open-source 3D printing solution. Back then, it was a one-man startup. Today, Prusa Research grows up to a 200+ team and we are shipping more than 6000 Original Prusa i3 printers per month to over 135 countries directly from Prague. 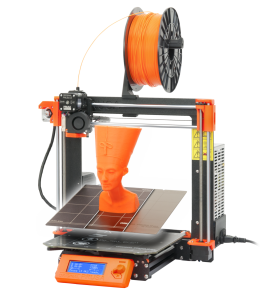 The Original Prusa i3 MK3 is the successor of the award-winning Original Prusa i3 MK2/S 3D printer. MK2S is the winner of the 3D Printer Shootout 2017 and 2018 in prestigious MAKE: Magazine and for more than a year, it’s the best desktop 3D printer according to 3Dhubs.com Trends. MK2S is also The Best 3D Printer for 2018 in “Workhorse” category on 3DHubs.com Guide with score 9.3 (the highest rated printer overall). Don’t forget to check my Youtube channel, where I regularly post troubleshooting videos, user guides, and other interesting videos. Upgrades are a great way not only for saving money, but also to learn about the construction of the printer’s hardware. A few years ago there was the Original Prusa i3 3mm which was upgradable to the Original Prusa i3 Plus 1.75mm (MK1). This printer can become MK2/S thanks to the next big upgrade and then you can go even for the latest MK3 (or MK2.5 if you wish). Original Prusa i3 MK3 Multi Material is the unique option to print with up to 4 different materials simultaneously. The use of up to 4 material feeders with only one hotend makes the solution calibration free and much easier to use than currently available systems. With Multi Material upgrade you can easily use one of the materials as water-soluble supports. To be more efficient with expensive soluble filament you can also print water-soluble interface supports.